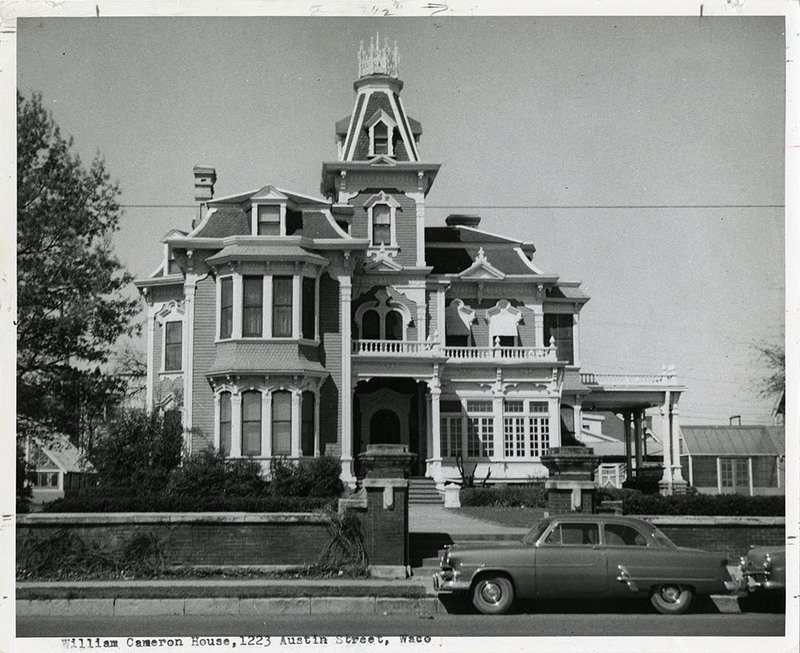 For eighty-eight years, the William Cameron House stood as a nineteenth-century architectural treasure near the intersection of Twelfth Street and Austin Avenue. The fine embellishments on the mansion dazzled Waco residents, and helped it to become a familiar and revered residential landmark of the city. Born in Scotland on January 11, 1834, William Cameron moved to the United States in 1852 and worked as a construction foreman for the Missouri Pacific Railroad. Cameron enlisted for the Union Army during the Civil War and was captured at the Battle of Springfield in 1861. After his release, Cameron worked in Missouri to supply grain for the government. While in Missouri, Cameron married Letitia Stewart and had two children. In 1865, Cameron began work for the Missouri, Kansas, and Texas Railroad and soon built retail lumberyards along the rail lines toward the Southwest and continued accumulating wealth. Cameron’s first wife died very early in life, and Cameron then married Flora Ann Berry of Little Rock, Arkansas. He became the father of three more children and provided generously to them all. The family moved to Waco, Texas, in 1876, where Cameron opened an additional lumberyard and headquarters for the William Cameron Company. He also got involved in the grain and flour mill business, and was a director at the First National Bank of Waco. 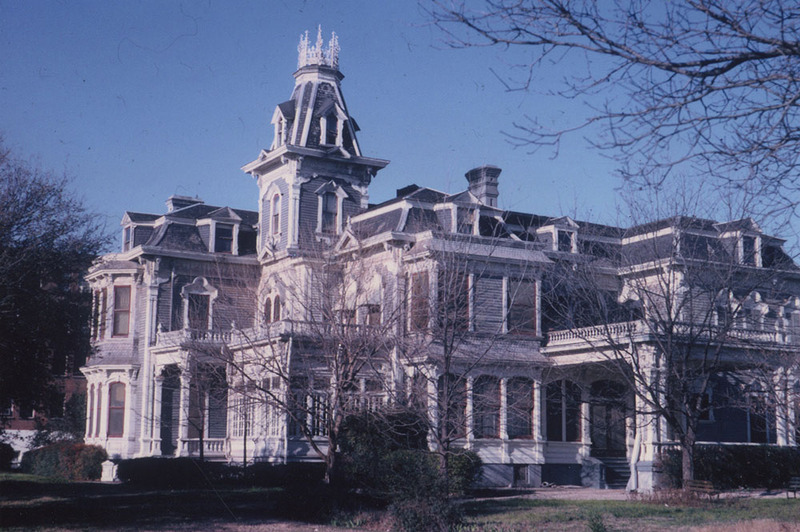 While residing in Waco, Cameron built a mansion for his wife Flora and their three children. The house was completed in 1885 as a surprise for his wife. 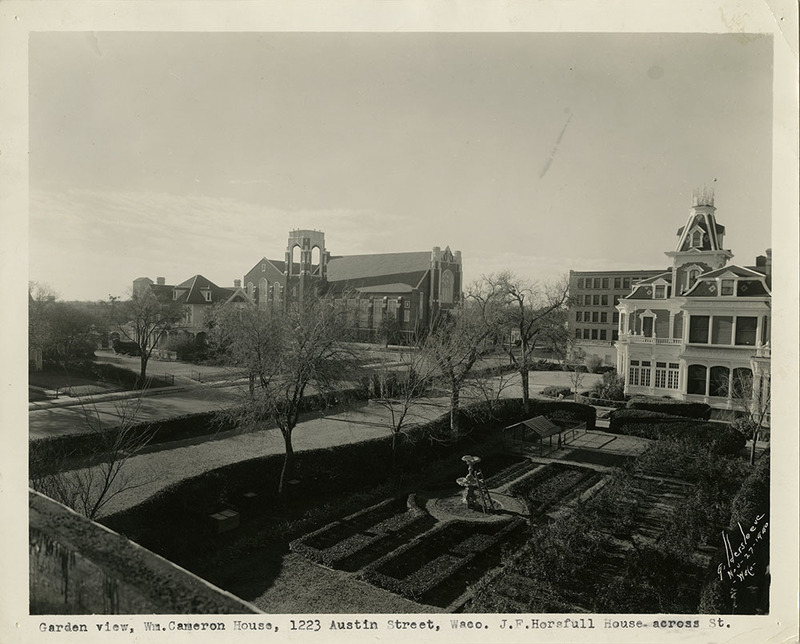 The designer of the sophisticated structure architect was William Winant Larmour, the same man who designed the construction on Baylor University’s Old Main and Burleson Halls. The house was beautifully decorated with white architectural millwork and ironwork and boasted a French blue background. Highlights of the mansion included windows made of heavy crystal glass, massive mahogany stairs that complimented the parquet flooring, and a roof topped with an iron-crowned cupola. The plentiful space served as a home for Cameron, his family and in-laws, and provided space for domestic employees. After the death of Cameron in 1899, the house was passed down to his son, William W. Cameron, and then to his grandson, Edward Cameron Bolton who saw the home fit for demolition. Coca-Cola Bottling Company bought the home and made plans to clear the property. Many citizens of Waco were disappointed; however, historic preservation was out of the question due to the condition of the house, its immense size, and the level of upkeep required. In 1966, a young entrepreneur, Homer Owen, took the responsibility of selling the contents of the house before demolition. 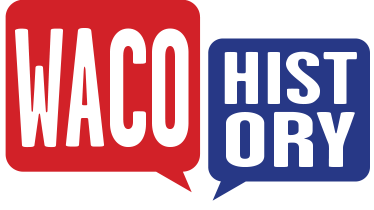 Citizens of Waco were excited to pay fifty cents apiece to view the inside of the house, while antique buyers encountered a feast. Everything inside, outside, and even parts of the house were for sale. Contents included love letters from Cameron to his second wife, proving that he was a very affectionate man. Doors, windows, trunks, evening clothes, wedding attire, and even structural items went into the hands of buyers. Once the interest of the public swayed from Cameron’s house, mysterious reports came to light about the presence of a ghost. As Homer Owen was preparing for the demolition of the house, vandals broke into the home and caused damages, and as a result, Owen stayed in the house to keep watch during the night. Owen laid awake and reported strange noises and footsteps. He asked several individuals such as teenage boys, Baylor University students, and carpenters to stay in the house overnight and keep watch. Some of the guests stayed overnight but never returned, and some only lasted half of the night. Many citizens of Waco rejected the stories, while some took them seriously and provided a theory that it was the ghost of the architect trying to drive people away to keep them from demolishing the house, or that it was the ghost of William Cameron himself. 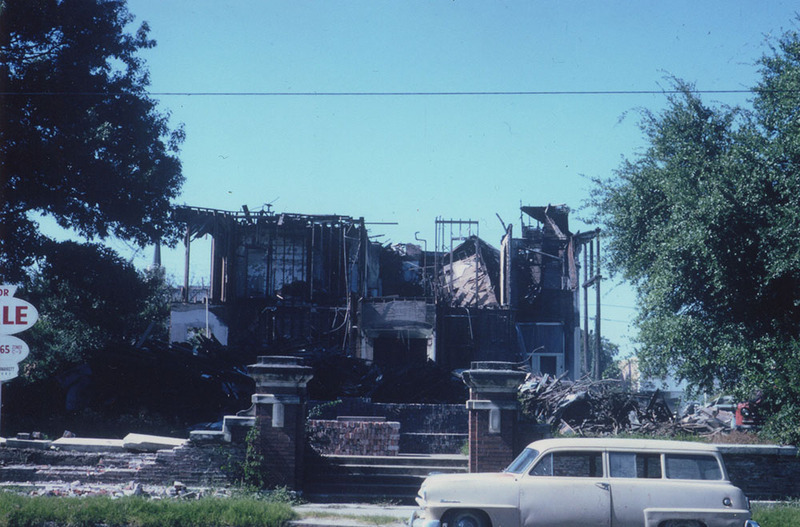 After many years of serving as a beautiful landmark in Waco, the empty house caught fire in 1966, and the remainder of the house was later demolished. Today the William Cameron house rests in photographs, history books, and the memories of the citizens of Waco. Sarah Miller, “William Cameron House,” Waco History, accessed April 26, 2019, https://wacohistory.org/items/show/151. Flachmeier, Jeanette H. "Cameron, William." http://www.tshaonline.org/handbook/online/articles/fca27. Travis, Marion. "An Introduction to the Story of the Cameron Ghost." Waco Heritage & History. (1979): 25-29. West, Tommy. "The Story of the Cameron Ghost." Waco Heritage & History. (1979): 30-34.